On March 19 11:58 a.m., patrols were dispatched to a hotel on the 500 block of Diemer Drive for a report that a controlled dangerous substance (CDS) was found in a room. Hotel staff reported while checking a room they located CDS and contacted police. Patrols arrived and observed the CDS on a mirror and also meth/heroin/cocaine/liquid HGH/and methadone tablets in the room. The suspect, a 37-year-old male from Philadelphia, was observed sleeping in a Ford Fusion in the parking lot of the hotel. Officers made contact with the suspect and while talking to him, the driver’s side door was open and an ASP baton was located in the driver’s side door panel, it was seized. Search of the suspect revealed he was in possession of a spring-assisted knife, which is also a prohibited weapon. The suspect was placed on summons for possession with the intent to distribute, possession of CDS, and unlawful possession of a weapon. He was released with a pending future court date. On March 18 at 10:51 p.m., patrol officers responded to the area of the 100 block of Mt. Laurel Road for a report of a pick-up truck driving erratic. Patrols located the vehicle-traveling pass Mt. Laurel Police Headquarters and subsequently conducted a motor vehicle stop. The driver, a 29-year-old male, showed signs of impairment and was arrested for driving while intoxicated. On March 18 at 7:30 p.m., patrols responded to Shoprite on Nixon Drive for a report of shoplifting. Loss prevention officers detained the suspect, a 30-year-old male from Columbus, who was observed removing a pair of pantyhose from a shelf, concealing them in his pocket, and exiting the store without paying. The suspect was taken into custody, charged with shoplifting and released on a summons pending a future court date. On March 18 at 2:11 p.m., patrol officers and Mt. Laurel EMS responded to a hotel on the 1000 block of Route 73 for a CDS overdose. The victim’s boyfriend reported the 27-year-old female victim ingested heroin, passed out, and he was unable to wake her. Patrol officers aided the victim and were able to wake her. She admitted to CDS/Heroin usage several hours prior. She turned over empty syringes and empty unmarked glassine folds that were seized. Mt. Laurel EMS and paramedics responded to aid the victim. On March 17 at 4:15 p.m., patrols responded to Preakness Drive for a report of fraud. The victim reported his Venmo account was hacked and sent $2999 to an unknown person. The victim stated he contacted his bank and Venmo to try and freeze his accounts. The victim stated his accounts have been frozen. On March 17 at 1:21 p.m., patrols responded to Red Cedar Court for a report of a stolen license plate. The victim reported when he was working on his vehicle, he noticed his front license plate missing. The victim reported he had last seen his front license plate on his vehicle, which was parked on Red Cedar Court on March 15, 2018 and believes an unknown suspect stole his license plate during the night of March 16. On March 15 at 6:54 p.m., patrol officers conducted a pedestrian stop in the parking lot of a hotel on the 1000 block of Route 73. A 39-year-old male from Lindenwold was found to have three outstanding warrants out of Lindenwold and Chesilhurst. A search incident to arrest revealed the male suspect was in possession of a small clear bag with suspected crack cocaine. He was charged on a warrant for possession of CDS. He was committed to Burlington County Jail. On March 17 at 2:01 a.m., patrol officers conducted a motor vehicle stop on Masonville Road and Fleetwood Avenue. The driver showed signs of impairment and was arrested for driving while intoxicated. The suspect was released to his mother and issued traffic summonses with a pending future court date. On March 17 at 1:16 a.m., patrol officers conducted a motor vehicle stop on Route 73. During the stop, officers detected the odor of marijuana. Subsequent search of the vehicle revealed a quantity of marijuana and a CDS smoking pipe. The driver, a 27-year-old male from Delran, was arrested. He was charged with possession of marijuana and possession of drug paraphernalia. He was released on a summons pending a future court date. On March 17 at 12:37 a.m., patrol officers conducted a motor vehicle stop on Route 73. During the stop, officers detected the odor of marijuana. Subsequent search of the vehicle revealed a quantity of marijuana. The driver, a 20-year-old female from Sicklerville, was arrested. She was charged with possession of marijuana and released on a summons pending a future court date. On March 16 at 5:14 p.m., patrols responded to West Marine on Route 73 for a report of a shoplifting. The store manager reported a white male and female entered the store inquiring about GPS fish finders. He advised two GPS units were placed on the front counter of the checkout area when the female left the store. A short time later the male left the store and did not purchase any items. The manager then realized one of the Garmin GPS fish finders valued at $699 was missing. He then observed the two suspects leaving the area in an older model Honda bearing unknown Pennsylvania registration, possibly a Civic or Corolla northbound on Route 73. On March 16 at 4:47 p.m., patrols responded to Wood View Drive for a report of theft by deception and fraud. The victim reported she was contacted by Apple claiming she owed $19.99. She was advised to purchase iTunes gift cards and arrange payments by providing the card numbers via telephone. She further explained after each payment she made, she was told a new charge appeared on her account. She bought a total of 14 iTunes gift cards totaling $950.00 for the payments. She contacted Apple customer service after becoming suspicious and was informed that she was a fraud victim. On March 15 at 6:54 p.m., patrol officers responded to the area of Route 38 and Briggs Road for a report of an aggressive driver complaint. Patrols observed the vehicle in question in a parking lot on the 3000 block of Route 38. Officers observed the driver, a 29-year-old male from Mt. Laurel, preparing to load a hypodermic needle for use. Wax paper folds containing suspected heroin was also observed in plain view. The driver was arrested for possession of heroin and a hypodermic syringe. The driver was not under the influence during the time of arrest. On March 15 at 8:58 a.m., patrol officers conducted a motor vehicle stop on Route 38 and Hartford Road. 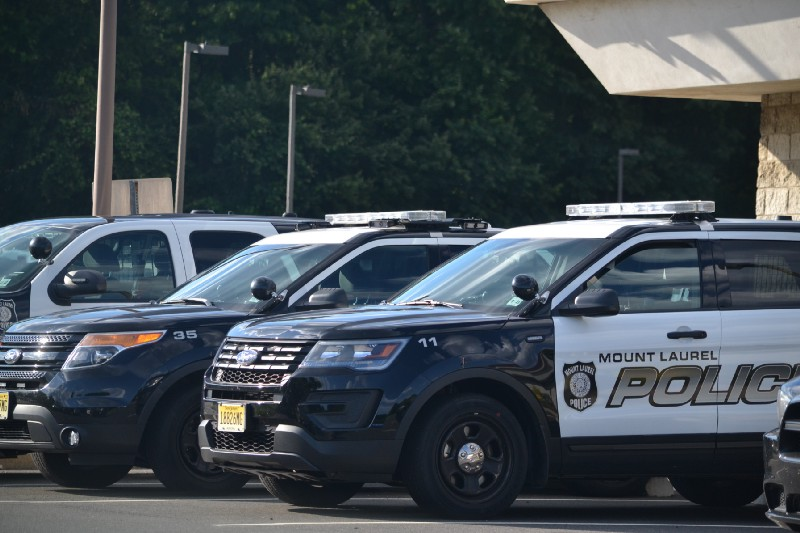 During the stop, the driver of the vehicle, a 23-year-old male from Clementon, provided a false name to avoid being arrested for an outstanding traffic warrant out of Vineland. The male was subsequently arrested and charged on a summons with hindering apprehension and motor vehicle violations. Vineland City released the arrestee on his own recognizance with a future court date. On March 14 at 11:37 p.m. patrol officers conducted a motor vehicle stop on Masonville Road and Fleetwood Avenue. The driver, a 55-year-old female from Burlington, showed signs of impairment and was arrested for driving while intoxicated. The suspect was released to her brother and issued traffic summonses with a pending future court date.